﻿ Money Can't Buy Happiness... But Happiness Can Get You Money! Why is it that we all desire to have more money? Money can provide opportunities for us like never before. 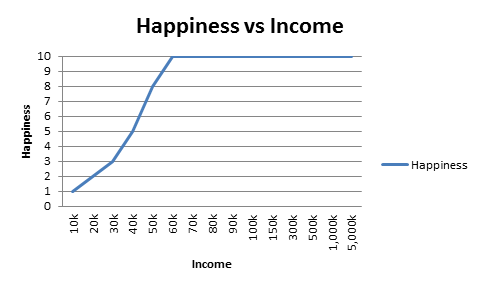 However, when we do end up with a higher income, why is it then that happiness is not necessarily a result? The fact that we know that money can’t buy happiness doesn’t seem to help. Most people continue to have the desire to create a higher income. I wanted to flip the notion that money doesn’t buy happiness on its head, and show you how happiness can lead to more cash in your hand. And it’s really quite simple… let’s take a look. Money can lead to happiness. With money, you have more options. You have more choice in what you can do with your time and energy. When you are out for dinner, you can decide to go to the super-expensive restaurant and pick the most expensive meal without feeling guilty. When you are buying a new car, you are able to get the one that you have always dreamed of – brand new, in black and with all the bells and whistles you have ever dreamed of. When you need a break, why not go on that holiday to Fiji that you have always been dreaming? You have the money. Spending money on more expensive items now is simply a form of short-term, instant gratification. Longer-term, delayed gratification can result in greater happiness. Although I am 28 and do not have any children yet, I prefer not to spend my days blowing my cash, having expensive nights out and going on exhaustive long holidays as many others my age like to do. You’re probably asking ‘why’ as normally I talk about doing what you love and doing it more often. That is true, however I also talk a lot about having a plan in place and delaying gratification to create sustained happiness. What makes me happy is actually knowing that I am building a life where I can support my wife and my children in the future. What makes me happy is knowing that I will be able to retire, financially sound so I can spend my old-age worry-free and enjoying the experience of watching my grandchildren grow. It’s perceived by many that more money can help in creating this life. However, there is interesting research that has showed otherwise. The Evidence that More Money Does NOT Lead to Increased Happiness. Known as the world’s most influential living psychologist, Daniel Kahneman during his TED talk in 2010 makes note of studies that have shown that earning less than $60,000USD per year can have a significant effect on your happiness levels. Simply put (and apologies if this offends anyone), the less you earn under this, the more unhappy you will be. However, when it comes to earning more than $60,000USD per year, Daniel Kahneman notes that it is the flattest line he has ever seen. There is absolutely no correlation between more income and more happiness. Here’s a little graph to show you a rough guide to what this would look like. This is obviously a very generalised example, but it helps to convey the message. I highly recommend that you watch Daniel Kahneman’s TED talk. It has been viewed 1.3 million times at the time of writing this and explains some amazing concepts around experiences versus memories and its effect on our happiness. Simply put, money can’t buy happiness. So why do we all strive for higher incomes when psychological studies have proven that income has little effect on happiness levels? We all have that perception that ‘I will be happier if I just had that little bit more’. Let’s flip this concept around on its head. Money can’t buy you happiness… but happiness can get you more money! A few months ago I shared with you the Happiness Model. Quite simply, happiness leads to greater performance which can eventuate it greater rewards. 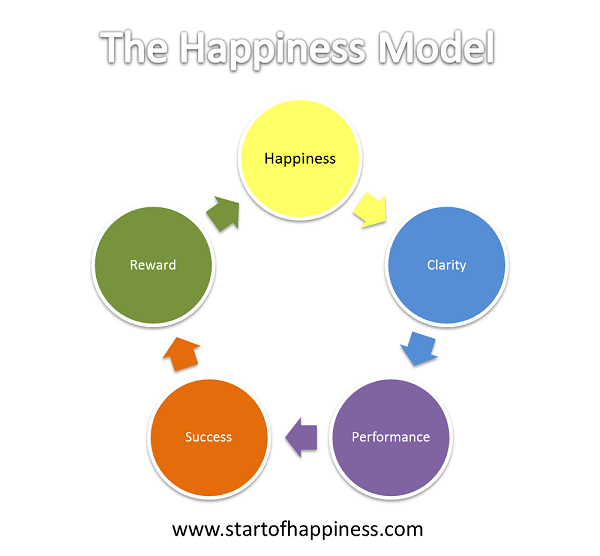 Let’s refresh what the Happiness Model looks like. Psychological studies have shown that greater happiness, wellbeing and positivity can lead to greater performance. This is through having a more optimistic and positive outlook as well as thinking with ‘clarity’. In whatever activity you are undertaking, you are more likely to be successful when you are in this state of happiness and performing at a higher level. What does this bring? This then brings the rewards that you are after. This can be both monetary and non-monetary. Perhaps it is simple recognition from your manager at work and getting a pat on the back. Alternatively, it might lead to hitting your sales targets and achieving your bonus, or a greater prospect of getting a promotion. The more sustained and consistent your happiness and positive outlook the greater performance and the more successful you will be in your pursuits. If you’re coming to work engaged and excited each day then you’re going to be more productive and more successful in what it is that you’re doing. This is no different in your personal life. What do you spend your time doing? What are your hobbies and your interests? What excites you? More often thvan not, the things that interest and excite you are the things that you are generally better at. This is not by chance. This is due to the fact that you’re in a more positive state of mind when you’re undertaking these activities. To summarise the points above, if you do what you love, you will generally perform better and you will reap the rewards. Not only will you be more wealthy both in monetary and non-monetary forms, you will also be living a more fulfilling and happy life. Get out into the world and enjoy what’s around… there is a world of opportunity! As the graph shows, money buys happiness up to $60,000/yr. Since most people don’t make that much, it’s a fairly safe assumption that a bit more money will make you happier . . . provided the trade off is not too great. But the mindset you’re speaking of is *the* key to long lasting success and happiness. Happiness starts from within. Sure it’s affected by outside influences, but it all starts with your mindset. Your worldview. Those who make more money have a money making mindset. They possess the qualities that allow them — even drive them — to earn more. If you want that kind of earning power then you need to develop those same qualities. You have to become the kind of person that has that high paying job. That’s hard work. Real hard. Because it means making fundamental changes in who you are. But nothing will ever change until you change yourself first. That’s the truth. You’re right… it is all mindset. I remember listening to Tony Robbins a few months back and something that resonated with me was when a homeless person on the street asked him for $1…. Tony simply pulled out a $100 note making it noticeable so the homeless man could see it and asked the man ‘why do you only ask for $1?.. you will only get what you ask for’. The homeless man didn’t really get it and so he didn’t actually ask for the $100. But it’s simply a mindset. In saying that, a money-making mindset is not everything, as you can still end up unhappy. And happiness is the ultimate goal in life, right? I think that money brings happiness until someone covers the basic needs explained by Maslow: food, clothes, a roof, a comfortable environment, some expenses, etc. After having covered the basic needs to live money begins to lose its appeal and the continuous search for more money brings unhappiness as many movie stars demonstrates with their lives. You’re right. This is where the $60,000 USD rule comes into play. This would be enough to satisfy your basic needs. Anything beyond this, it’s worth looking for that thing you are most passionate about. Turning your attention and energy to this will most likely lead to more happiness AND more money. I enjoyed your post. Your statement “with money, you have more options.” I’ve been poor and I’ve been rich, bottom line is, more options is the most freeing feeling you can experience – so I make it a point in my life to have more options! Glad you mentioned that TED talk, Brendan. You did a great job of being more balanced by acknowledging unhappiness does come in when you’re below a certain income point, but you also bring up the idea of hedonic adaptation in regards to those over the $60,000 mark. Very informative article and for those looking more for the idea of more money =/= more happiness, I’d recommend reading a bit more into Stoicism. William B. Irvine’s “Stoic Joy” does a great job and was my first introduction to Stoicism. It brings up the idea of more belongings/income doesn’t always make someone happier because they baseline pretty quickly. You’re right. Baselining happens all the time. It’s like when you get a promotion or a payrise. It’s motivating for the first week or month, however this motivation fades becase you do baseline very quickly. I’ll have to read more into Stoicism. Sounds interesting! So true…when you put heart and soul into your work (when you are truly passionate about it), you are doing it because you love it and not for external rewards. Your work process becomes a true reward, and as a result you give it your all. The best motivation is by far the intrinsic one. Money comes after, as a natural result, and is rarely a main goal. Intrinsic motivation is THE way to go! In fact, it’s the ONLY way for living your most passionate and happiest life. The hardest part is finding that ‘niche’ or that particular thing that you can do to create an income from it. That’s the thing… I think perhaps people get ‘too focused’ on the money and therefore create less enjoyment in what they do. Honestly, do most people REALLY enjoy doing accounting and finance, or do they do it just for the money? What would you rather: $200k a year doing something you hate, waking up demoralised each day for 30 years? Or $80k a year, waking up super-excited, passionate and happy about what you are doing? I certainly know what I’d choose… the key is to try get both! 🙂 And this is normally a result of happiness coming first. Making money or being wealthy is not of itself, a bad thing. In fact, for the most part I admire people who succeed in business – as long as that success doesn’t come at the cost of their values, their health, their relationships, their integrity, their life, or their emotional, psychological and spiritual development. As long as we recognise and use money for what it is and don’t bow down before it, we should have a relatively healthy relationship with it. Do I have financial goals? Yep. Are they at the top of my list? Nope. Do I focus on, or obsess about, money? Nope. Have I ever struggled financially? Yep. In fact, for the majority of my adult life I have not earned a lot of money. Money should ultimately be a result of your interests, relationships, values, integrity etc…. as the old saying goes: ‘money is the root of all evil’. This is more so the case when you’re focused JUST on money and not actually enjoying what you’re doing. I agree with what some of the others have said: while money won’t buy you happiness, it can buy you a better quality of life which does lead to some improved happiness. But as the study pointed out, eventually, you get to a point where more money doesn’t equal more happiness. Great post! most of us go through life doing things backward. There is a load of evidence that money will not make you happy, and we will not go into this here due to time restrictions. But the reverse is true. This post is awesome because it addresses the unfortunately taboo topic of money. I like the honesty of this post. I think that the pursuit of money is a very interesting thing. We need enough to be comfortable. If we aren’t in a good financial situation then were F’ed. We will spend all day and night thinking about money. But (as you pointed out) once we reach a particular point, then it has no connection to our happiness. Jim Rohn discusses how the tragedy of getting a million dollars through a will. He always talks about the beauty of being a millionaire is not the money, but rather the person you must become to earn this type of money. Actually Jim Rohn is the one who helped me understand the character benefits of earning more money. Now, one of my life goals is to become a millionaire. Not because I love money, but I know I must develop discipline, focus, commitment, integrity, and extremely high character to make this type of money. Money alone will not buy you happiness. That’s why lotto winners return to their default unhappy state once the novelty has worn off. For me, money can buy me the freedom to do what really matters. Most can’t reach this level because their mentally in state of lack. of debt. I agree with Izzy above, building wealth through hard work can give you invaluable skills which are discipline and willpower. Two vital qualities lacking in people who are always in debt. to find excellent writing like yours these days. I honestly appreciate individuals like you!